8 fl.oz/236ml or 1.8 fl.oz/53 ml bottle of Beard Shampoo with a refreshing Verbana Lime scent. Specifically formulated for your facial hair. Mild ingredients such as green tea and chamomile won't irritate sensitive skin. Zeus Beard Shampoo in Verbena Lime is specifically formulated for your beard and can be used to clean your hair on a daily basis without stripping your beard of its natural oils. 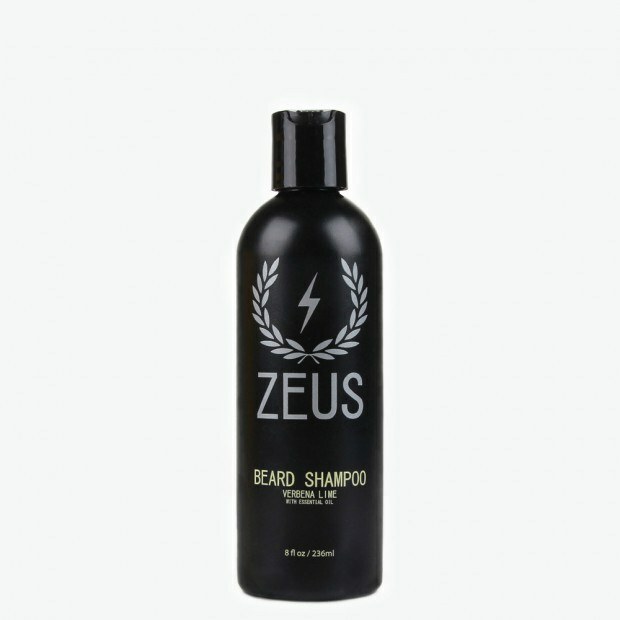 Zeus Beard Shampoo will leave your beard soft, unlike regular soaps and shampoos that can damage hair follicles and leave skin dry and irritated. 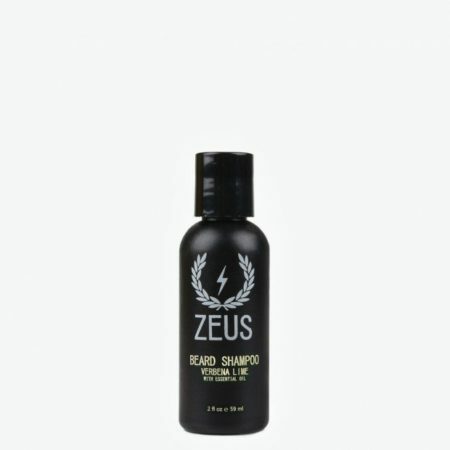 It’s is made with mild, natural ingredients to keep your beard clean, healthy, and shiny. Perfect for sensitive skin! Dragon’s Blood: Dragon’s Blood has anti-inflammatory and antibiotic qualities. It helps fight acne by reducing inflammation and discomfort while calming the skin. Chamomile: Cleans the beard while protecting the skin. Green Tea: Suppresses inflammation and reduces irritation. Directions: Push the top open and squeeze a small amount of beard wash onto your fingertips. Massage into your face and beard (try not get it in your eyes). Rinse and repeat as necessary. *Tested on beards, NOT animals. Ingredients: Water (Aqua), Sodium C14-16 Olefin Sulfonate, Sodium Lauroyl Sarcosinate, Cocamidopropyl Hydroxysultaine, Cocamidopropyl Betaine, Sodium Chloride, Disodium Laureth Sulfosuccinate, Fragrance (Parfum), Sodium Benzoate, Lauryl Glucoside, Coco-Glucoside, Xylitylglucoside, Anhydroxylitol, Glyceryl Oleate, Xylitol, Potassium Sorbate, Sodium Hydroxypropylsulfonate Lauryl-Glucoside Crosspolymer, PCA Glyceryl Oleate, Daemonorops Draco (Dragon’s Blood) Extract, Chamomilla Recutita Flower/Leaf (Chamomile) Extract, Camellia Oleifera Leaf (Green Tea) Extract, Tetrasodium EDTA, Sodium Saccharin, Citric Acid.